Product: Mashers Era 320ml Square Clear Plastic Disposable Dessert Party Bowls – Packs of 50 was added to cart. 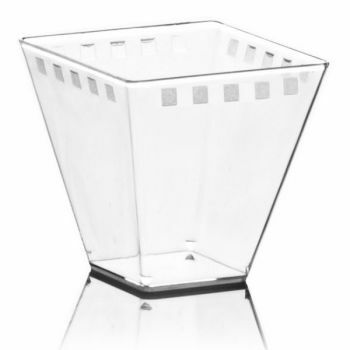 From Mashers brand new Era Collection, these Square Disposable Plastic Dessert Bowls will make a stylish addition to any buffet, banquet or food display. Made from robust food grade plastic, they have a generous capacity of 320ml, and they are suitable for serving warm canapes, chilled desserts, and a range of finger foods and snacks. A great investment for party planners and event caterers who regularly use disposable tableware, these plastic party bowls can be hand washed and reused, and they are fully stackable to save space. Coordinate with other pieces in the Era Collection.